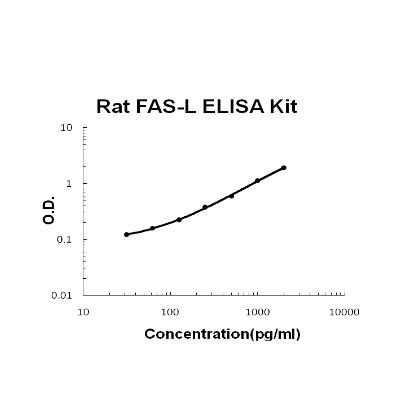 Sandwich High Sensitivity ELISA kit for Quantitative Detection of Rat FASL. 96wells/kit, with removable strips. Expressed in activated splenocytes and thymocytes. Moderate or weak expression found in small intestines, kidney and lung. . Cell membrane ; Single-pass type II membrane protein . Cytoplasmic vesicle lumen . Lysosome lumen . Colocalizes with the SPPL2A protease at the cell membrane. Is internalized into multivesicular bodies of secretory lysosomes after phosphorylation by FGR and monoubiquitination. .
Cytokine that binds to TNFRSF6/FAS, a receptor that transduces the apoptotic signal into cells (PubMed:7505205). Involved in cytotoxic T-cell-mediated apoptosis, natural killer cell-mediated apoptosis and in T-cell development (PubMed:7505205). Initiates fratricidal/suicidal activation- induced cell death (AICD) in antigen-activated T-cells contributing to the termination of immune responses (By similarity). TNFRSF6/FAS-mediated apoptosis has also a role in the induction of peripheral tolerance (By similarity). Binds to TNFRSF6B/DcR3, a decoy receptor that blocks apoptosis (By similarity). .